Nelson is a cycling place. Cycling is big in Nelson. In fact, Nelson has been voted as one of the top mountain biking destinations by visiting international experts. But if (like us) you are not into hard-core cycling, there are plenty of easy riding options too. The Great Taste Trail is a biking and walking trail, suitable for hybrid comfort style bikes. It is not a mountain biking trail. It is off-road, apart from some sections which are on country roads with virtually no traffic. The trail starts at the Nelson iSITE Information Centre in Nelson city and is marked with blue trail markers. The off-road trail surface is either firm gravel or sealed (concrete or asphalt) and is wide enough for 2 people to cycle side by side for most of the way. The flat sections of trail are suitable for beginners. The whole trail is suitable for cyclists and families with some cycling experience. A multi-geared hybrid comfort bike is recommended for longer rides. E-bikes are also suitable. The Great Taste Trail consists of the Rail Route and the Coastal Route. The Coastal Route is completed and runs from Nelson to Kaiteriteri (87 km), via Mapua and Motueka. The Rail Route branches off the Coastal Route in Richmond, 10 km from the start in Nelson. From Richmond, the Rail Route continues to Brightwater and Wakefield. Belgrove is the next settlement on the trail. The Spooners Tunnel is an exciting new section which passes through a previously disused rail tunnel. From here, the Rail Route contiues to the settlement of Kohatu, which is the end of this trail (for now. )There is also an on-road route linking the Rail Route to the Coastal Route via Pigeon Valley. 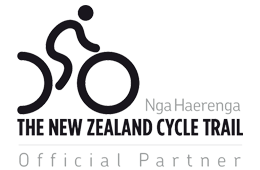 The Gentle Cycling Company is located close to the trail in Stoke, 8km from Nelson city and 3km from the trail junction - the point where the Rail Route splits from the Coastal Route. The Dun Mountain Trail is a 43 km loop. It officially starts at the Nelson iSITE, though most locals begin a few kilometres away at the popular Codgers Mountain Bike Park. After leaving Codgers, the trail follows the route of New Zealand’s first railway before emerging into the alpine mineral belt near the summit of Dun Mountain (878m). With a summit elevation of 1,129 metres, be prepared for quite an uphill (and downhill) grunt. Dun Mountain offers magnificent views of the Bryant Range, Pelorus Valley and Tasman Bay. From the summit, the trail descends into the lush Maitai Valley, and takes a river-side trail back down the valley to the city. This is a Grade 3 intermediate to Grade 4 advanced trail. Riders should be competent mountain bikers, with good fitness levels, and ride a mountain bike with full suspension. For your safety, riders should take the following: mobile (but reception is patchy) food, drink, wet weather gear, puncture kit, pump and basic first aid kit. There is also a Great Rides APP available on Google Play and the APP site. Kaiteriteri is located one hour by car from Nelson city. This small coastal village is one of the most scenic areas in the Nelson/Tasman region, offering gorgeous golden beaches, walking tracks and swimming in crystal clear waters. It is also the gateway to the Abel Tasman National Park, with kayaking, water taxis and charters available to access the park, for day trips or longer for walking the trail. The Kaiteriteri Mountain Bike Park, is located just minutes from the main beach, and offers a range of trails from Easy, to Intermediate then Advanced and finally Expert. From its conception in 2009 the park has been managed and developed on behalf of the Kaiteriteri Recreation Reserve by Kaiteriteri Mountain Bike Park Incorporated. In the North West corner of the South Island of NZ, a long-forgotten gold miners’ road has been revived as a mountain biking and tramping trail – connecting the old dray road in the Lyell (Upper Buller Gorge) to the mighty Mokihinui River in the north. The spirits of the old miners and track builders are inescapable and four ghost towns populate the route. The 85 km-long single track Old Ghost Trail traverses majestic native forest, open tussock tops, river flats and forgotten valleys. For most fit and competent riders, The Old Ghost Trail is grade 4 advanced and will typically be ridden over 2-4 days. There are twenty-one bridges along The Old Ghost Road that provide safe passage over the main waterways. Be aware that some remaining unbridged waterways and trail sections have potential to flood under heavy and/or sustained rainfall. It is recommend starting at Lyell and riding in a south to north direction owing to the technical nature and gradient of 4km of trail north of Ghost Lake (this section is easier to descend than ascend). Silvan Forest is located in the Stoke/Richmond area, close to Nelson city. This mountain bike park is located in a privately owned forest, made accessible for recreational use by its generous owners, Rick and Sarah Griffin. The comprehensive trail network provides a great country riding area, with trails suitable for beginners through to advanced riders. This park is very popular with local mountain bikers.